Prime Minister Justin Trudeau says he stands up for Canadian interests, "whether it's softwood or software." He made the comments during a stop at video software company Vidyard in Kitchener, Ont. on Tuesday. Prime Minister Justin Trudeau says he wants companies to see Canada as a place where they can grow and succeed on the world stage. 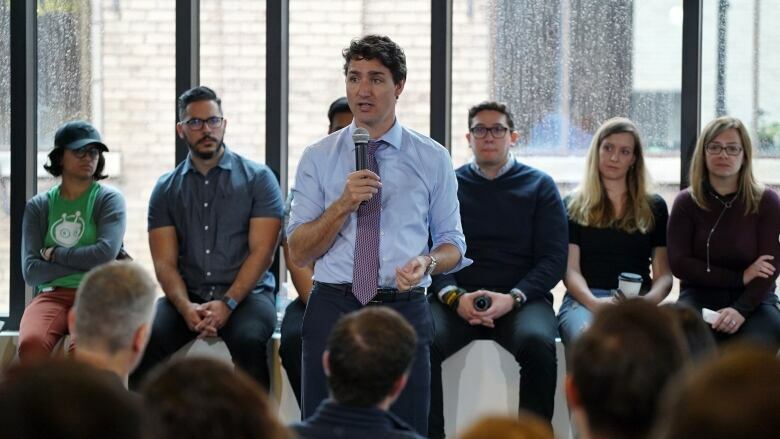 "I want people to be able to choose Canada and know that if they do choose to build, to support, we will be there to support them," Trudeau said Tuesday in Kitchener during a stop at Vidyard, a video software company. "I know that Canada can compete and succeed against any community, any country in the world. All people are looking for is an opportunity to demonstrate that." Trudeau held a question and answer session at the company. He said companies like those in Waterloo Region are what he points to when he is promoting this country. "Having an amazing example of a place that is innovative, that is forward-thinking, that is open, that is inclusive, that understands that diversity and different perspectives are incredible sources of creativity, of innovation, of success. These kinds of things, great institutions like Vidyard, great companies like this, are exactly what I get to point to, to say 'yeah yeah, Canada's exciting and we're doing great things,'" Trudeau said. Vidyard CEO Michael Litt questioned Trudeau on protectionist policies, particularly coming from the U.S. administration under President Donald Trump. "We are an export company. About 95 per cent of our business is done outside Canada," Litt said, adding they are worried how the policies could affect their company. "Standing up for Canada's interests is what my job is, whether it's softwood or software," Trudeau responded to applause. "What we have to know is that we are tremendously interconnected in our economy with that of the United States. But it's not just a one-way relationship," he added. "As I've pointed out to the administration many times since they got elected, there are millions of good, U.S. jobs that depend on smooth flow of goods, services, and people back and forth across our border, lack of red tape and regulation that blocks and gums up the system." He said Canada has had to be innovative. With natural resources, Canada often has to compete with countries that do not adhere to the same high environmental standards. "We've, in many cases, had to become more efficient and more innovative than our natural resources competitors around the world," Trudeau said. "We've always been able to be really thoughtful and innovative and creative and use science and research to advance our ways of succeeding and being competitive."